An attractive write-in activity book jam-packed with things to do, including puzzles to solve, doodles to draw, games to play, new words to learn and over 150 stickers. 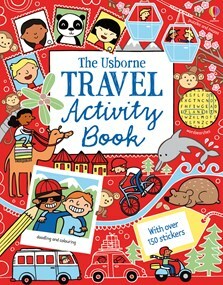 Puzzles, mazes and colouring tasks are set in popular holiday destinations around the world and feature holiday experiences from catching a plane to applying suncream. Puzzle answers and solutions are given at the back of the book. I wouldn’t start your car trip without this clever book... an ideal travel companion for little ones!